At Betty Blocks, we want to debunk the myth that no-code platforms will wipe out IT. On the contrary, no-code is intended to support IT and the business. To reassure the developers encountering no-code in their organizations who may be feeling resistance to it, who better than a fellow developer to share his perspective of no-code. Dennis Tel is a software developer at Betty Blocks. 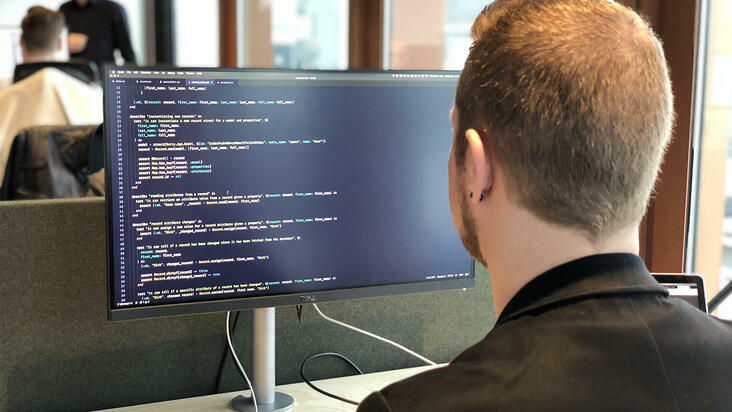 As a programmer for the no-code platform, Dennis understands both the challenges of IT and the value of no-code. Here is his take on the platform and how IT departments should perceive no-code. We take pride in our craft. Learning how to program is not easy. You put in a lot of work to learn how to program and build applications. You find a certain joy in that challenge. This is why I assume other developers are resistant to no-code. For me, my first reaction would be, my skills are no longer required. That’s what the word no-code triggers. There are also a lot of developers who have never heard of no-code. They don’t understand what it is and why it’s here or why it even exists. There are common problems that every IT department experiences. One of these is satisfying the business demand for applications. With no-code, the business can enlist citizen developers to build applications with IT faster. It's an overall challenge to maintain your current system and improve it while also having to service the rest of the business and facilitate change. Supporting all these aspects is time consuming and complicated. Having a no-code solution that does part of that for you? That’s the biggest win for developers. Ultimately the goal is to bring business and IT together. For IT, shadow IT is one of the main problems to prevent. Our role is to service the business. If you can’t meet the demands, you need to help people meet the demands. Applications that are developed without the knowledge of IT are applications that at some point will have to be maintained by IT. If IT doesn’t know about it, it creates a lot of technical debt. Technical debt consists of software that is put together without careful planning and later needs to be changed or replaced. Technical debt occurs in every organization that creates and uses technology, but it's an even greater issue when there is Shadow IT. It’s the biggest blocker to making effective changes in an organization. It’s an interesting concept for businesses that need to change fast and adapt faster to changes within the business or within the market. The biggest bottleneck within companies is the IT department. This is the case because you need a lot of developers to support changes within internal applications and you need even more to make rapid changes to those applications. Being able to distribute the workload beyond the IT department is the biggest win for the organization. To give an example, adding a button to the website can take either 10 minutes or up to an hour. These are minor changes that are often distracting developers from their actual work. It’s helpful to have citizen developers who understand the needs of the business and can use no-code to solve the many tasks that fill up IT’s day. There’s a second reason why I like no-code. It’s a very easy introduction into application and systems development. A no-code platform makes IT easy to get into and it helps create a better understanding of what IT does. Overall, this creates a better understanding between the business and the IT department. No-code users see part of what is involved in creating and managing applications. The idea of no-code is like learning from Bob Ross. It shows you some very basic things that allow you to start painting: in this case, developing and testing out ideas. This makes it accessible to most people that might not have the time to master programming, such as other people in the line of business. In the end, if you want a really nice painting, you need to get an expert involved. No-code doesn’t mean no developers, but they’re introduced later in the process. As a practice that developers are familiar with, the only way to know is to try. To see how no-code can help your IT department, try the Betty Blocks platform with a demo here.